Today, many people are taking positive steps to reduce the risks posed by major health problems like cancer, cardiopulmonary diseases, hypertension, and diabetes. But there’s one disease that makes the top-ten list of worldwide health conditions, and yet isn’t thought about as much as many of the others. 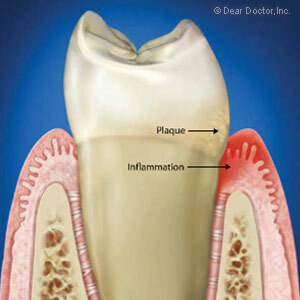 That malady is severe periodontal (gum) disease — and according to a new study, it’s the sixth-most prevalent health condition in the world. The study, released by the International and American Associations for Dental Research, reveals that some 743 million people around the world — about 11 percent of the global population — suffer from severe periodontal disease; that percentage hasn’t changed significantly since 1990. The study also shows that while an individual’s chance of developing this condition rises gradually with age, there is a steep increase in people between 30 and 40 years old, with a peak at age 38. If severe periodontal disease is such a major concern, why isn’t it “on the radar”? A 2010 report from the U.S. Surgeon General, titled “Oral Health: The Silent Epidemic,” gives some clues. For one thing, diseases related to oral health don’t always produce dramatic symptoms: Even tooth loss, for example, is sometimes (wrongly) regarded as an inevitable consequence of aging, when it’s more often the result of disease or injury. For another, these conditions disproportionately affect people whose voices aren’t always heard: children, the elderly, and the disadvantaged. Severe periodontal disease is clearly a challenge to the public health. But what can you do as an individual? Plenty! The good news about periodontal disease is that it is largely preventable, and very treatable. Prevention is chiefly a matter of maintaining good oral hygiene. Have you flossed lately? Is your brushing technique up to snuff? Do you avoid sugary snacks and beverages (especially between meals), and visit your dentist for regular checkups? If so, you’ve taken some major steps toward preventing periodontal disease. But despite their best efforts, it is difficult for some people to control periodontal disease without extra assistance. That’s where a periodontist can help. Periodontists are concerned with treating problems of the gums. We use a number of methods to combat periodontal disease — including removing plaque bacteria, restoring healthy tissue, and educating people about how to maintain better oral hygiene at home. Your general dentist may refer you to a periodontist if warning signs are noticed, but you don’t need a referral to come in for an exam. If you notice the symptoms of periodontal disease — redness or inflammation of the gums, a bad taste or odor in your mouth, or any amount of bleeding when you brush — then it may be time to have your gums checked.